This article is about the demographic features of the population of Brunei, including population density, ethnicity, education level, health of the populace, economic status, religious affiliations and other aspects of the population. 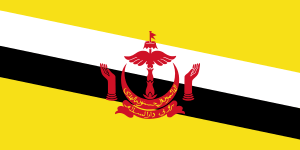 Like neighbouring countries, Brunei is a Malay-dominated country. Many cultural and linguistic differences make Brunei Malays distinct from the larger Malay populations in nearby Malaysia and Indonesia, even though they are ethnically related and share the Muslim religion. Brunei has a hereditary nobility with the title Pengiran these are, more often than not, related to the Sultan by blood. The Sultan can award to commoners the title Pehin, the equivalent of a life peerage awarded in the United Kingdom. The Sultan also can award his subjects the Dato, the equivalent of a knighthood in the United Kingdom, and Datin, the equivalent of a damehood. The requirements to attain Brunei citizenship include passing tests in Malay culture, customs and language. Stateless permanent residents of Brunei are given International Certificates of Identity, which allow them to travel overseas. The majority of Brunei's Chinese are permanent residents, and many are stateless. Petroleum wealth allows the Brunei Government to provide the population with one of Asia's finest health care systems. The Brunei Medical and Health Department introduced the region's first government "flying doctor service" in early 1965. Malaria has been eradicated, and cholera is virtually nonexistent. There are three general hospitals--in Bandar Seri Begawan, Tutong, and Kuala Belait--and there are numerous health clinics throughout the country. 1 The Kedayan were only mentioned as a separate ethnic group in the 1960 census; they are probably included in the Malay in the other censuses. Bruneian (Malay or also called Kedayan) 67%, Chinese 15%, indigenous 6%, other (including European and Filipino) 12%. Indigenous groups include the Iban people (a branch of the Dayak people), the Dusun and the Melanau. 1 2 "World Population Prospects, the 2012 Revision". un.org. 1 2 "United Nations Statistics Division - Demographic and Social Statistics". un.org.